The NHL has tabbed former enforcer George Parros to run its department of player safety. Parros replaces Stephane Quintal, who is stepping down to pursue other opportunities within hockey but is staying on this season to help with the transition. George Parros, the moustached man who spent almost a decade as an NHL enforcer, is now in charge of the league's player safety department. After a career in which he fought 159 times and racked up 1,127 penalty minutes, Parros believes there's one major reason he'll succeed as the new vice-president of player safety. "It uniquely positions me for the job is that I played the game as physically as anybody and I never once was fined or suspended," Parros said Thursday at the NHL office in New York. "I know where that line is. I know how to protect my guys or intimidate but not injure or hurt." 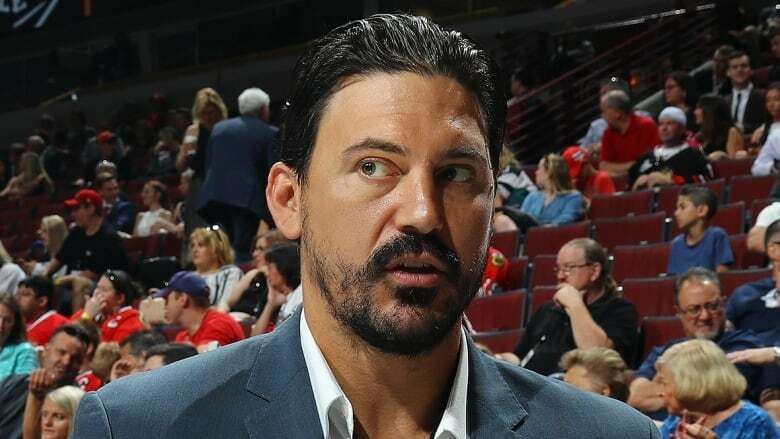 In replacing Stephane Quintal, who's stepping down to pursue other opportunities in hockey but is staying on this season to assist with the transition, Parros intends to take a stricter tact on certain slashing and what he called "non-hockey plays." Recent high-sticking incidents involving Gustav Nyquist and Duncan Keith that drew six-game suspensions would likely be harsher under Parros, who doesn't feel the department needs a major shakeup but just some adjustments in specific areas. "If you can tell that something was done on purpose and it has nothing to do with the play … whether it's stickwork into a guy's face or something like that, these non-hockey types of plays, these major incidents that don't happen too often, but I'd like to come down harder on those," Parros said. The league plans to more closely monitor certain types of slashing, namely those to players' hands that cause injury. Sidney Crosby severed Marc Methot's finger and Eric Staal broke Johnny Gaudreau's finger with slashes last season. "If they seem to be more intentful or directed towards the fingers and hands with greater force, we're going to be looking to do something: fines, suspensions, whatever it might be," Parros said. "We're going to try and change player behaviour and we're very well aware that you can't get every slash and it's not a huge issue, but obviously it's something that's becoming a problem." Parros spent nine seasons with the Los Angeles Kings, Colorado Avalanche, Anaheim Ducks, Florida Panthers and Montreal Canadiens and said he paid attention to discipline when he played and eyed a role in player safety. He worked the past year as a director of player safety with now Florida Panthers senior advisor Chris Pronger and others. Commissioner Gary Bettman said the Princeton-educated Parros "possesses one of the brightest and most innovative young minds in our game." "He has immersed himself in all aspects of player safety during the last 12 months, and his selection to run this department not only will maintain the stability and consistency in decision-making that have been essential to the department's success but also will enable it to continue evolving in step with our game," Bettman said. Fully aware that being the discipline czar is a "thankless job," Parros doesn't mind taking the heat from players and general managers and potentially angering fans. A life of taking and delivering punches to protect teammates, this is a natural transition. "It's an intense environment, but I like that," Parros said. "I like that intensity. I'm not playing anymore, and that's an interesting job. It's not your 9 to 5, but nothing is in this game."